Decided list of tasks (which readers must realize were NOT all gonna get done) too depressing. Just hit highlights of week. I started milking Hyacinth a month ago, just evenings. 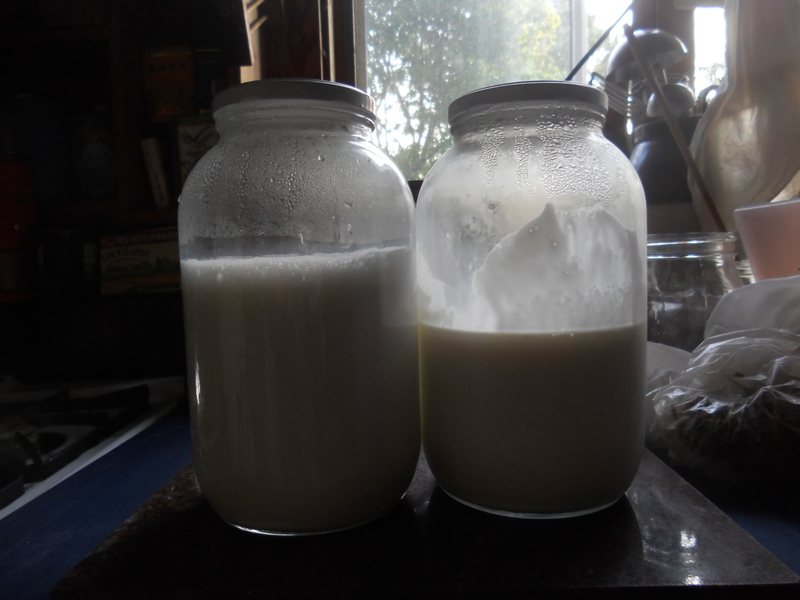 Her yield quickly grew from just under a quart, to almost 2. Her disposition did too, from leaning against me to try to shove me off the milking stand, to standing quietly the while. By last week, at 2 pm she was bleating with the discomfort of a full udder. So Sunday I began milking mornings as well. Hyacinth's yield from Monday pm (right) to Wednesday AM increased by almost a pint! Not only is her yield still increasing, but the cheese from her milk (fresh chevre, feta, fresh curd and Neufchatel, so far) has the smoothest texture and flavor of any of my goats’ milk. 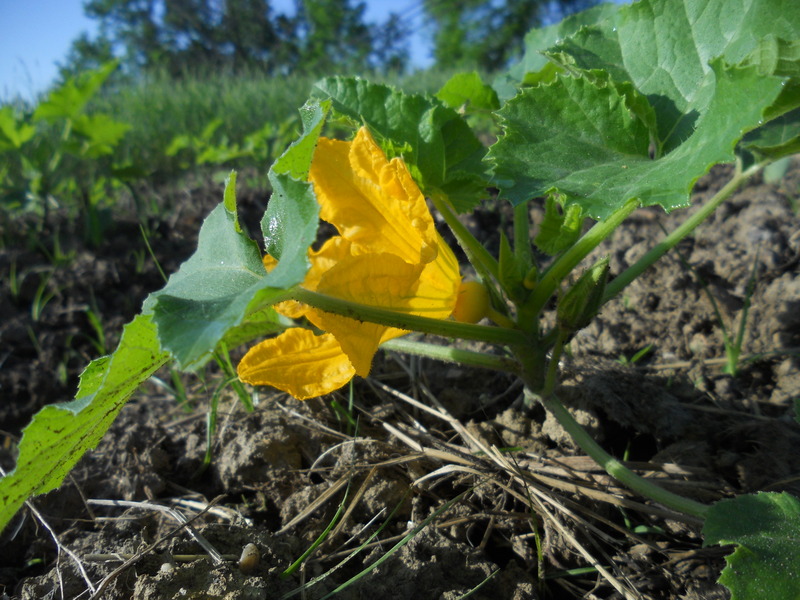 – cultivate Squash- nice to walk over with the sharpened hoe and find them blooming! 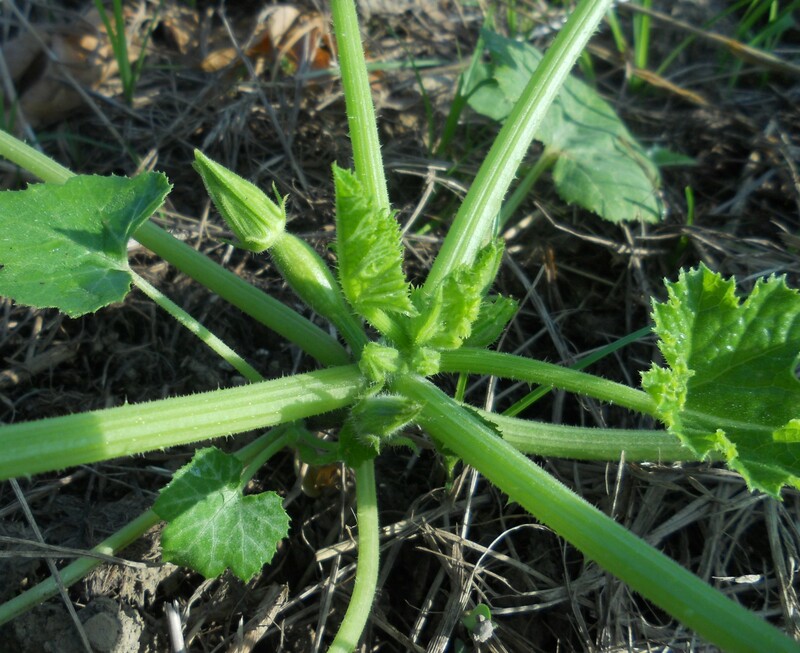 Every June at Market, someone asks, “But if you pick them all, you won’t get any squash, will you?” Here are two images showing the two types. The ones I sell for frying and stuffing are just the males. 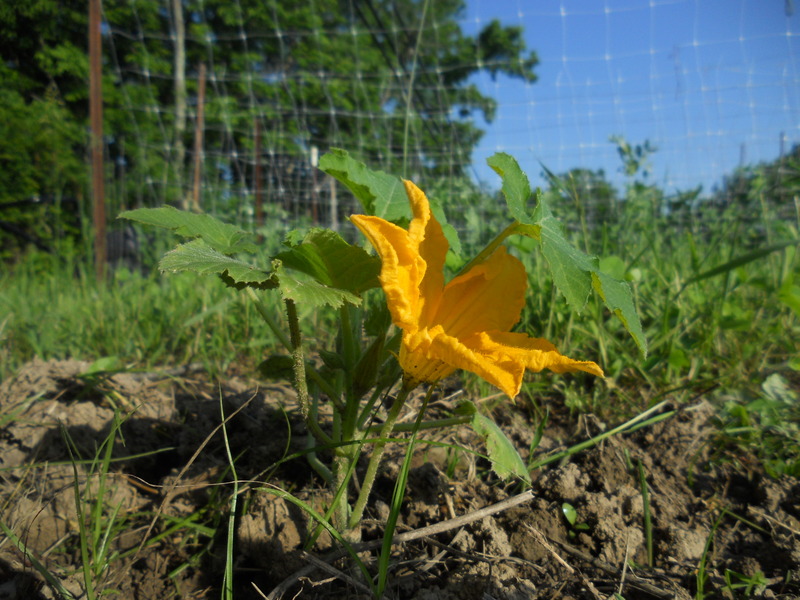 A tiny squash shows clearly at the base of the just-opened female blossom. Tuesday: Harmon’s Processing, quite a trek (Thanks Steve!) with 2 kids of mine, 2 of Larry’s and a small lamb he’s been bottle feeding. Get tractor running and post auger hitched. Grateful just to have it running! Wednesday – Tiller to tractor (Yes!) Till tomato, basil and pepper ground. Set Basil ? Yes! Thursday – Set tomatoes – a month late, but it’s done. Call agent. The 2-acre parcel of flat land across the road is for sale with the farm that adjoins mine. I’d like to buy it, not only for gardening, but to keep the quiet and privacy that’s blessed this place for 23 years. News as it happens! Friday: Market prep: which should have included picking some bunches of an interesting new species, except that the goats got to it before I did. Well, it’s “cut & come again” as the catalogues say, so it will be back. 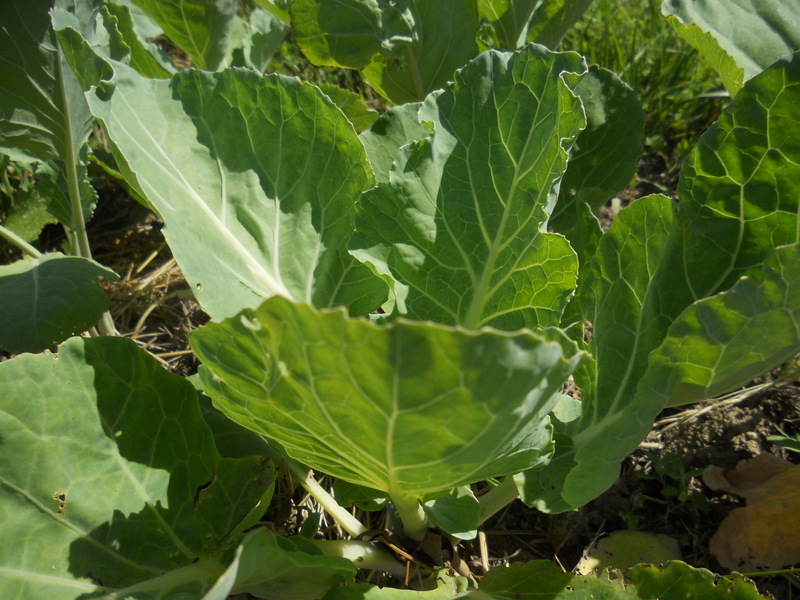 Portuguese Tronchuda, or Leaf Cabbage, a non-heading variety, wonderful in soup with sausage and potatoes. To any of the days above, can be added, at morning, “Milk” and at evening, “Pick snap peas – Milk.” Harvest is starting to take as much time as planting. The care and feeding of animals is leading to milk and cheese. More about milking, soon. « B of E – Pretty Dirt!